Select “Batch Download Replay Data…” menu item by clicking on “Utilities” menu. 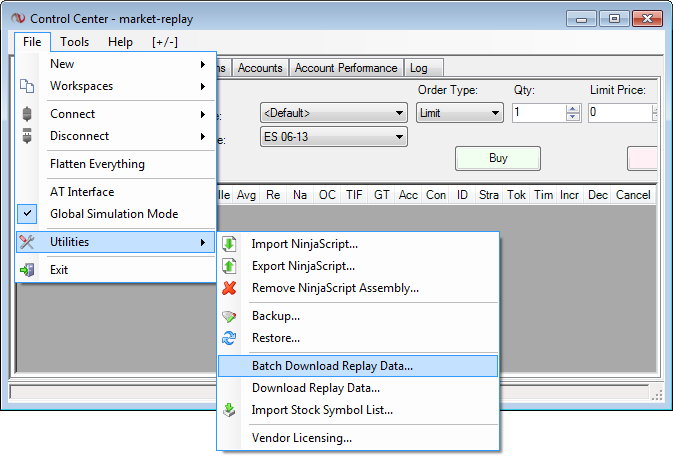 Enter your user name and valid email address in the MarketReplay Add-On User Registration window. Read the license agreement to check the corresponding field and press “Register” button. Immediately after you will get this message. A confirmation email with activation link will be sent to your email address. You must click on confirmation link in your email to activate your free version. Check you Inbox for email from marketreplay.net (make sure to check your “Spam” or “Junk” folders too). If you still can’t locate it, please contact us.After that you may click on “Retry” button to continue using your activated Free Version. Once you activate you Free Version, please proceed to the How to Use MarketReplay Downloader link.